Almost 6 Regents exams of questions. Answers given to all questions. Small number of questions per set for a quicker and less overwhelming practice for the Regents. Clear, brief, simplified, and easy-to-understand explanations of answers. Contains current Regents exams and grading formats. Keep track of day-to-day progress, improvement and readiness for your Regents exam. More studying benefits to build your confidence and preparedness. 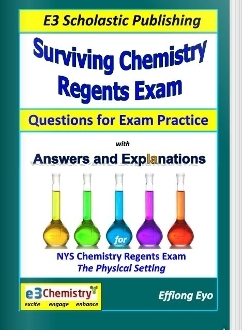 Preparing for Chemistry Regents exam has never been easier, more exciting, more engaging, more understandable and less overwhelming.